Windows are one of the most important features of your home. They can completely change the light, character, and feel of the room.Aspen Exterior understands exactly how windows can transform any building quickly and easily. Our contractors provide quality window replacement in Palatine and the surrounding area. Our experienced contractors will sit down and discuss changes, design strategy, and price with you to match you with the perfect window. We can even create a window space where there isn’t currently one. Your imagination is the limit with Aspen Exterior! A flashing membrane is applied to the sill plate before the new windows are placed into the opening. The window is then shimmed, squared, and insulated around the perimeter. New wood trim is applied. Pine is standard, but any exotic hardwood is optional. 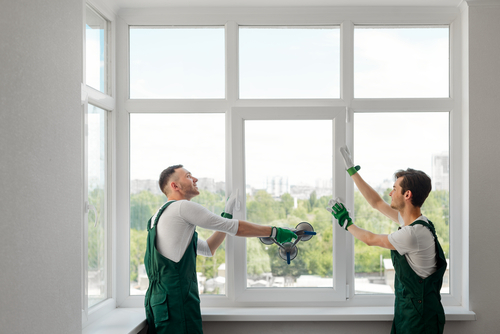 The new windows can be cut picture-frame style or with stools (sills) and aprons that are ready for painting or staining. The exterior has custom formed aluminum trim applied or custom trimming with products such as Azek, Hardie or Miratec. The surface is then sealed to the exterior siding or brick. If you have questions about our prime methods for window replacement, please give our contractors a call. The old window sashes and any jamb liners are removed. A new window is manufactured to fit inside the existing window frame. We quickly install the new window and ensure it is properly and thoroughly sealed. Insert installation eliminates the need for new trim on the interior that can save on labor and material costs. If you have any questions or concerns about the installation method, make sure to contact or call our office today! Aspen Exterior is a leader in window replacement for houses and businesses of all sizes. For more information about our services, pricing, or availability, call (847) 590-5600.